In another sign of repeating 2015, the Chinese are beginning to mobilize their “reserves” again. Three years ago, in a futile attempt to staunch CNY’s stubborn “devaluation” various government authorities blew through just about $1 trillion. It didn’t work. You would think that everyone could learn from this episode. I think the Chinese did, which is why in 2017 they engineered the bypass through Hong Kong in order to hide the continued peril; capital outflows in the mistaken parlance of the mainstream. All that changed, unsurprisingly, in January. At first, unlike 2015, it was a trickle. Only small balances were deployed scattershot suggesting that officials weren’t going to repeat their mistake. 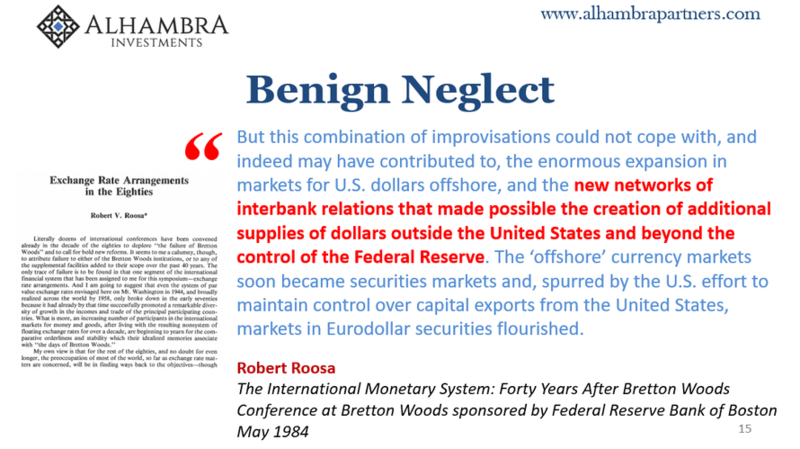 Western Economists may still view foreign reserves as insurance against this kind of thing, but eurodollar squeeze #3 proved conclusively the absurdity of being so monetarily ignorant. If you can’t steady your currency with $1 trillion, no one can. Period. To chuck that mind-boggling amount into the ether and get nothing to show for it is about as conclusive a demonstration. The PBOC and others’ reluctance to do the same thing in 2018 is therefore understandable. They let CNY go mostly unaddressed (apart from some clandestine operations here or there) because what else were they going to do? This, I believe, explains why CNY plummeted in 2018 compared to the “ticking clock” stairstep decline two and three years ago. That’s another aspect monetary officials may now appreciate, how in the end the mobilization of reserves tends to make things worse. All that may be changing, however. I have to assume with great reluctance, pretty much they don’t know what else to do. Foreign reserves are flowing out of the government’s various pockets all over again. China’s State Administration of Foreign Exchange (SAFE) reported that in September 2018 total foreign reserves fell by $22.69 billion. It was the most since January, that prior month a one-off fix. Today, SAFE estimates that in October China shed another $33.93 billion. This was the largest monthly usage since the last ticking clock in 2016. On a 2-month basis, it is pretty clear things are getting serious in China with CNY hanging just on the other side of 7.0. It is a pretty clear signal for escalation. Of what? 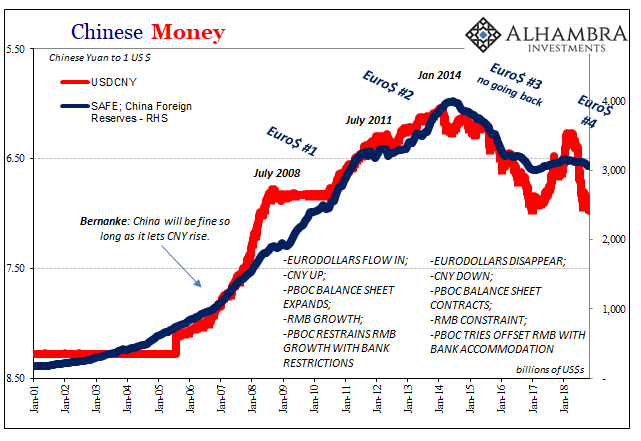 All these things are connected; from eurodollars to Chinese foreign reserves to Chinese internal money (RMB). They all follow from this exogenous state. 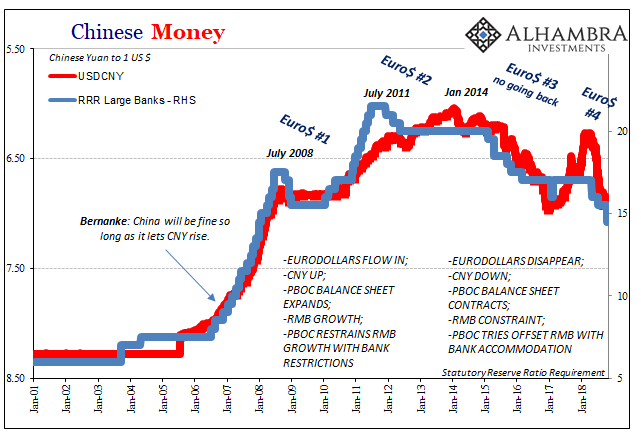 As the eurodollar system goes, so does everything else in China (as well as everywhere else). 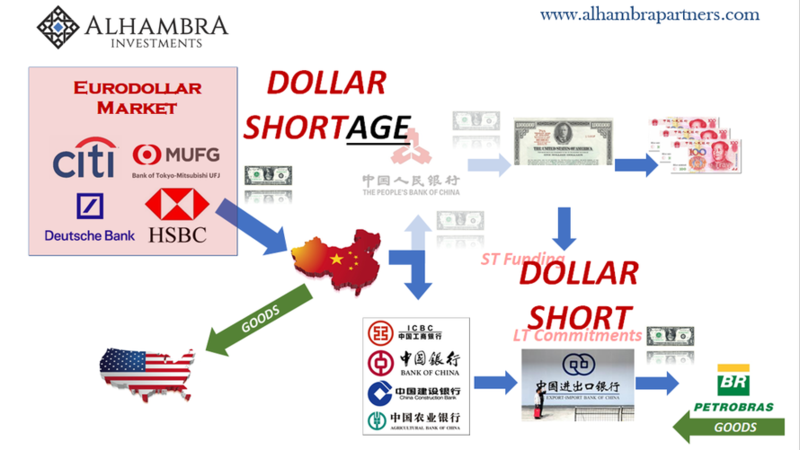 In this case, if A = B, and B = C, then obviously A = C. In other words, all the factors pictured below (3 charts) are the same thing approached from different Chinese angles: eurodollars. 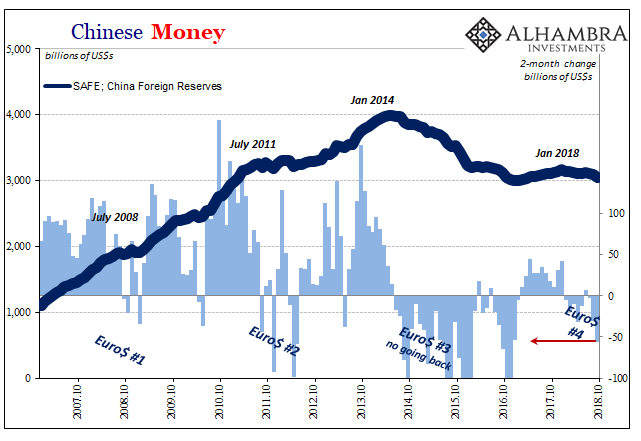 Thus, working backward, the more China feels compelled to act against various forms of internal monetary tightness we know right then its origin. 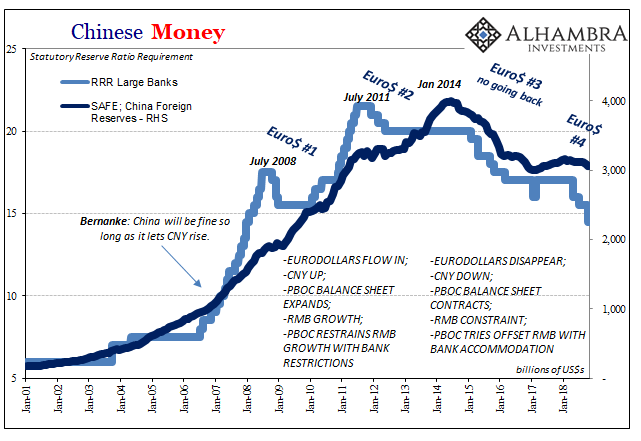 China tells us everything we need to know about the eurodollar system, and therefore the dollar nobody on this side of the world pays any attention to (continuing the age-old policy of benign neglect that in the past eleven years has devolved into just criminal neglect). 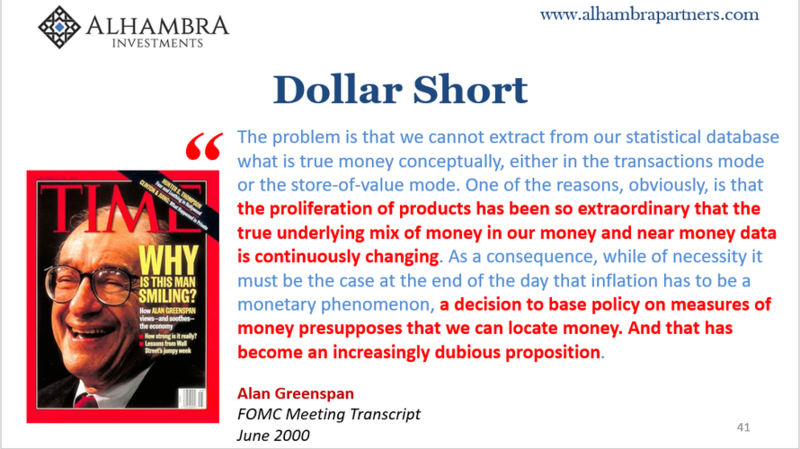 The dollar shortage, or eurodollar squeeze, however you wish to call it, is growing more disruptive not less (where’s federal funds lately?) We can see the results of the disorder scattered all across the globe. Nothing is more consistent with the sudden struggles in the European economy of late as China’s declining foreign reserve balances. 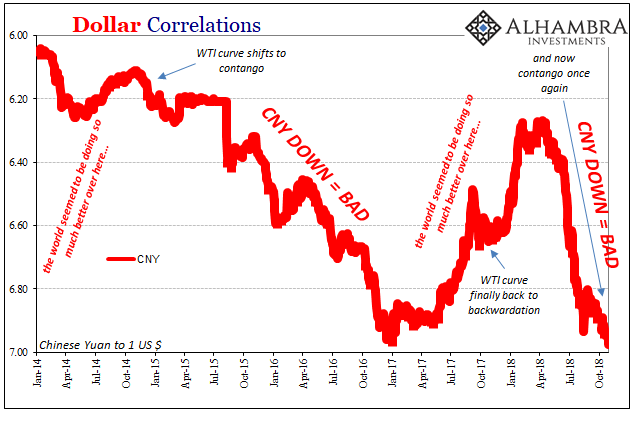 Likewise, the absolutely huge warning in the oil market, the futures curve going contango, is very much related to China going 2015. The shift is being led by China, where the economy’s weakest performance since 2009 is set to worsen unless a peace can be struck in the trade war with the U.S. Factory readings from Asia already show a fallout, with Taiwan, Thailand and Malaysia slipping into contraction territory. The euro-area too is losing momentum, expanding in the third quarter at half the pace of the prior three months as Italy and Germany stagnated. The answer is given to us by SAFE.